Here in Wales we have a tradition of calling people by their role and location rather than their name, hence I acquired the title of Talogwitch, the wise woman or seer of Talog. 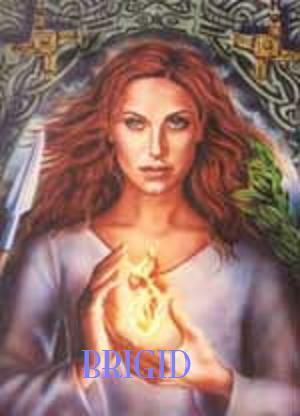 Even in the Dark Ages and 'Burning Times' no witches in Walse were ever put to the flame for it is inherent within Celtic tradition to accept and appreciate the wisdom of independant and individual crones. The concept of a witch being evil has only existed since Papal indoctrination decided that female wisdom challenged its authority, and thus the Anglo Saxon word became devalued from meaning 'woman with her wits about her'. Any practitioner of the Craft is as good or as bad as the person themselves, and just to reassure you, I work for the light, my calling is to heal and enlighten. My aim is to teach the almost forgotten ancient skills of the 'Old Religion' and thus re-empower women, returning the feminine to its proper status. Theis is not a battle of the genders, nor is it a battle of the religions , it is a return ito inner spirtituality and ecological compatablility that will engender harmony and heal this ailing planet and help the struggling peoples of this world. ‘Amazon Awaken’ is a female self help manual that instructs women how to empower themselves; in short it is a book of sisterly solidarity. It speaks to all who have heard the distant battle bugle echoing across the land, and wish to heed the Goddess call to arms. The time has come for the women of the 21 century to acknowledge their worth and claim back their inheritance; for too long we have silently followed three paces behind like lesser beings, owned and bound by duty not love, forced to obey, bewildered, belittled and brainwashed. After over two and a half millennium of constant and relentless misogyny and cultural manipulation women have been left understandably disorientated, confused and hesitant, however the tide is turning. Many have shied away from the hurtful indoctrination of modern religions, unwilling to allow faith to be used to fuel and perpetuate hatred. They have witnessed the hypocrisy and futility of blind faith and instead chosen to seek enlightenment through personal spiritual awareness. Though predominantly pagan this book does not preclude any of the world’s ‘daughters of Eve’, for we are one great and ancient sisterhood in the divine feminine, that modern religions cannot separated or divide; we are united by blood , and like the tides we are ruled by the moon. The reappraisal of life values, and re-evaluation of time both explained and taught within this book, through ritual and meditation, precipitate an understanding and appreciation of natural time and Mother Earth. It is from this harmony with creation and the total knowing of self that the power of self healing is generated, then and only then can we begin to heal others and indeed to heal this ailing planet. The format adopted within the book is simplicity itself; a lifetime is parodied to one single day’s passage of the sun through the sky; there is preparation as we wit for dawn; then one day from dawn to dusk, followed by the peaceful reward of dark blessed night. Easter- The triumph of life over death, another story of recycled Pagan belief. Continuing the theme of recycled or borrowed Pagan beliefs and practices, the ever turning wheel brings us to the festival of Ostara, and the Christian celebration of Easter. Although many of Christianity’s adaptations of Pagan concept have needed manipulation to fit the bill, Easter however with it’s theme of death and rebirth has been an easy adaptation, for Ostara or Eostre is just that, the birth of spring’s new life after the death of winter. For thousands of years long before defined culture divided the races of humanity, our simple ancestors dwelling safe within the earth, told tales around their life sustaining fires of a divine Earth Mother. It was she who watched over them, guiding and providing, ever present in her seasonal aspects of Maiden in spring time, blooming into Mother with the fertile summer, bearing fruit, and then through into autumn as she changed to Crone, eventually returning with death back to the earth at winter. In the Eleusinian Mysteries the myth tells how Persephone as Maiden is the Goddess of springs bounty, but one day whilst she played with her nymphs in a tranquil meadow she was seen by Hades whose desire for her was so great that he raped and abducted her into the underworld to be his bride. Demeter her devoted mother was distraught when she could not find her daughter and proceeded to search the world, enlisting the help of Hecate with her burning torches held high so that not a corner of darkness was left un searched. When Demeter learned that Zeus had conspired in the abduction she was so furious that she refused to allow the earth to blossom until her daughter was returned. Life could not continue in endless winter so Zeus ordered Hades to return Persephone, however because she had eaten a pomegranate seed he claimed she now belonged to the underworld; compromise was mediated and it was agreed she should spend winter with her husband in the underworld, and her return to her Mother each spring heralds the spring. The analogy of the myth is the creation of the seasons; however it needs to be remembered that Greek mythology in terms of ‘deep time’ is actually very recent, dating from c. 500 BC. However archaeological evidence can prove that humanity perceived the cycle of death and rebirth, divine life-force within the earth akin to the flora of nature, from as early as 4000BC. Evidence to substantiate these early concepts of rebirth can be seen in the material culture of the Neolithic, an excellent site is the Boyne valley, and within its16 km there are at least 40 tombs. The passage grave of Knowth1 is a particularly good example, as it has in recent years been extensively excavated and accurately restored to allow visitors to experience the Neolithic concept of life, death and the spirit eternal. Within the depths of the mound the construction of the cruciform camber runs east, west. The alignment of the passages is deliberate, allowing the rising sun to penetrate the 40m long eastern passage on the equinoxes of 21 March and 21 September, flooding the inner chamber with life giving life. Newgrange, also in the Boyne valley is another grave restoration project; the exterior of the mound has been restored to former Neolithic glory with its original paved crust of white quart. Each dawn as the sun rises the tomb is bathed in sunlight reflecting against the quartz crystals, again symbolic of life born anew. The vast passage of time brought human evolution and development of the human mind; our childlike need for witnessing the physical matured into acceptance of belief refreshed through bardic stories. This then further progressed into structured and approved acceptance of divinity, imparted through the teaching of culturally manipulated myths; which in turn progressed into a politically acceptable and expected affiliation with respective divinity as demonstrated within Roman culture. A fundamental aspect of Roman progress that is seldom appreciated by modern historians is their zest for acquiring foreign wisdom from every corner of the known world; just as they physical made the world theirs by conquest so they made knowledge appear theirs through writing, although research within ancient texts shows their ability to swallow up vast areas of borrowed wisdom in all areas of life and spirituality, then through a process of Romanization, through scholarly study and recording, reproduce it as literature and reclaim it as their own. By the arrival of Christianity the Romans had already conquered, consumed and digested the Teutons2; the race from whom the word Easter derives. She was their Maiden Goddess of the Moon and Spring, Ostara is her Viking name but she was Eostre in the Anglo-Saxon tradition. Her celebration was the feast of Eostar at the Vernal Equinox and the symbolism within eggs and rabbits has remains unchanged, for it is the aspect of fertility, pregnant earth bringing forth new life. It is the very same symbolism that was physically demonstrated in the Neolithic, at the Spring Equinox, with the first light of dawn. Like the Pagan Great Rite, the sun’s shaft of masculinity filled the tomb, the barren earth womb where there had only been death, with life giving light. And it is this same aspect that Christianity uses, the conquering of death by life anew, for scripture says that Jesus after three days rose from the grave, and this is their celebration of Easter. Neolithic Britain and Ireland’ Caroline Malone, 2001, Tempus , Stroud. 2 According to both Strabo the Roman philosopher and map maker, and Velleius the historian, the Tuetons were a Germanic people heralding from the area now known as Jutland. With the help of the Gauls they clashed with the might of Roman in northern Europe, at the end of the 2nd century BC, and were defeated. This is a Pagan celebration that traditionally needs dark and needs firelight. In our homes it is easier to use candle light, or both if you are lucky enough to have an open fireplace. The colours to wear and decorate the altar are red and blue. Red for Brigit symbolizing farrier/blacksmithing, with the great fires and red hot metal. Blue for healer, with red hot metal straight from the fire, the only saving means of staunching blood flow and sterilizing wounds. Do this at noon when the sun is overhead and hot, not a cool cloudy day. You need solitary undisturbed time, a pen and paper, a fire proof dish and matches or a lighter. Wear a hat, or have a parasol if necessary. Let me introduce myself I am the TalogWitch, that is to say the local seer and crone of the tiny Welsh hamlet of Talog, I have been reading Tarot for over 40 years. Ordinary fortune-tellers tell you what you want to happen; witches tell you what's going to happen whether you want it to or not. Strangely enough, witches tend to be more accurate and less popular. Thank you for visiting me, I hope you enjoyed your stay; before you leave sign my guestbook below and leave a little message about your visit. This totally free e-course will teach you how to aid and enhance your own well being, through interaction with the powerful energy of Mother Earth, gifted to all of humanity within Her very essence, Her lithics, by using rocks, stones and crystals. If you are interested in receiving a 5 part E-course right to your email contact me, subject line "Self Heal" and I will send you the first part of the E-course. Thank you for your interest.